Lysyl oxidase-like 2 (LOXL2), a collagen-modifying enzyme, has been implicated in cancer invasiveness and metastasis. We evaluated the expression of LOXL2 protein, in addition to carbonic anhydrase IX (CAIX), keratin 19, epithelial cell adhesion molecule, and interleukin 6, in 105 resected hepatocellular carcinomas (HCCs) by immunohistochemistry. LOXL2 expression represents a subgroup of HCCs with more aggressive behavior and is suggested to be a poor prognostic marker in HCC patients. Hepatocellular carcinoma (HCC), representing over 90% of all primary liver cancers, is currently the sixth-most prevalent cancer and the second-leading cause of cancer death worldwide.1 In HCC, patients who are eligible for curative treatments such as surgical resection, liver transplantation, and radiofrequency ablation are limited and transarterial chemoembolization and chemotherapy (sorafenib, regorafenib) are less effective in prolonging survival.2–4 Therefore, the discovery of novel and promising molecular targets in HCC is needed to develop better treatment options. Lysyl oxidase (LOX) and its family members LOX-like (LOXL) 1–4 are copper-dependent amine oxidases that catalyze the covalent crosslinking of collagen and elastin, resulting in increased ECM stiffness. The aberrant expression of LOX family oxidases and/or deregulated oxidase activity is responsible for the pathogenesis of various diseases, including cancer.12,13 Among the LOX family members, LOXL2 has been deemed an important regulator of tumor progression.14 Early studies on breast cancers demonstrated that LOXL2 overexpression induced the formation of fibrotic foci within tumors with invasive properties15 and that increased LOXL2 expression promoted the invasiveness of breast cancer cells and induced EMT.15–17 In addition, increased LOXL2 expression was reported to be associated with tumor aggressiveness and poor prognosis in head and neck, lung, breast, stomach, and esophageal cancers.18–20 Moreover, LOXL2-specific antibody was found to be effective in both primary and metastatic xenograft models of breast cancer.21 In HCCs, Wong et al.22 demonstrated that only LOXL2, among the LOX family members, was substantially overexpressed in human HCC tissues, when compared to non-tumoral liver tissues, and it was up-regulated by hypoxia and transforming growth factor β (TGF-β) signaling. In addition, they showed that LOXL2 promoted intrahepatic metastasis by increasing tissue stiffness and facilitated extrahepatic metastasis by enhancing recruitment of bone-marrow-derived cells to metastatic sites.22 Therefore, LOXL2 is likely to contribute to HCC progression, especially under the hypoxic and inflammatory microenvironment, and may be a potential therapeutic target. However, the clinicopathologic relevance of LOXL2 expression in human HCC tissues remains unclear. In the present study, we investigated LOXL2 protein expression in primary HCC tissues from 105 patients who underwent curative resection, including its correlation with the expression of hypoxia-related (carbonic anhydrase IX [CAIX]), stemness-related (keratin 19 [K19] and epithelial cell adhesion molecule [EpCAM]) and inflammation-related (interleukin 6 [IL-6]) markers, which are known to play a pivotal role in HCC progression. We also evaluated the clinicopathological and prognostic significance of LOXL2 protein expression in HCCs. All HCCs included in this study were morphologically typical HCC; cases that could be classified as combined hepatocellular-cholangiocarcinoma were excluded. A total of 105 formalin-fixed, paraffin-embedded HCC specimens were obtained from the archives of the Department of Pathology, Severance Hospital, Yonsei University College of Medicine, all of which were surgically resected between March 2006 and January 2010. This study was approved by the Institutional Review Board of Severance Hospital (IRB number: 4-2014-0654), and the requirement for informed consent was waived. Clinical data from each patient were obtained from a careful review of medical records. Patients consisted of 82 males and 23 females, and the mean age was 57.3±10.9 years (range, 31 to 86 years). Eighty-five cases (81.0%) were related with hepatitis B virus, and the remaining cases were related with hepatitis C virus (6.7%, n=7), alcohol (5.7%, n=6), or unknown etiology (6.7%, n=7). All patients with cirrhosis (51.4%, n=54) were classified to Child-Pugh class A. All patients did not receive any preoperative treatment, such as transarterial chemoembolization, percutaneous ethanol injection, radiofrequency ablation, radiation, or chemotherapy. Follow-up data including the status at last follow-up and occurrence of distant or intrahepatic metastasis or local recurrence was available in 99 patients. The mean follow-up period after surgery was 49.9±19.7 months (range, 3 to 86 months). Overall survival (OS) was defined as the time from surgery to death. Disease-specific survival (DSS) was defined as the time from surgery to death in patients with HCC involving >50% of the liver, HCC with extensive portal vein thrombosis by tumor, or HCC with extrahepatic metastasis.23 Extrahepatic recurrence-free survival (EHRFS) was defined as the time from surgery to initial diagnosis of extrahepatic recurrence, and disease-free survival (DFS) was defined as the time from surgery to initial diagnosis of recurrence regardless of location. Histopathologic analysis was performed on whole sections by routine pathologic examination, and the variables included tumor size, differentiation according to Edmondson-Steiner grade, multiplicity of tumors, tumor necrosis, tumor capsule formation, microvascular and major vessel invasion, and pathology of non-tumor liver. The amount of fibrous stroma in tumor was semi-quantitatively evaluated on hematoxylin and eosin-stained slides. Two 2-mm core tissues from donor paraffin blocks of each HCC specimen were taken and arranged in recipient tissue microarray (TMA) blocks using a trephine apparatus (Superbiochips Laboratories, Seoul, Korea). One core of non-neoplastic liver tissue from each case was also included in the TMA blocks. Immunohistochemistry was performed for LOXL2 (1:400; Abcam, Cambridge, MA, USA), CAIX (1:1000; Abcam), K19 (1:100; DAKO, Glostrup, Denmark), EpCAM (1:1000; Calbiochem, Darmstadt, Germany), and IL-6 (1:100; Abcam) on TMA sections. Except for IL-6, immunohistochemical staining was performed using an automated staining system (Discovery XT; Ventana Medical Systems, AZ, USA) according to the manufacturer’s instructions. For IL-6, deparaffinized, rehydrated TMA sections were treated with protease K for antigen retrieval, incubated with IL-6 antibody (room temperature, 1 hour) and secondary antibodies (DAKO), and then developed with an Envision kit (DAKO) using 3,3-diaminobenzidine as chromogen. The positivity of CAIX was defined as membranous distribution in at least 1% of the tumor cells with moderate or strong intensity. 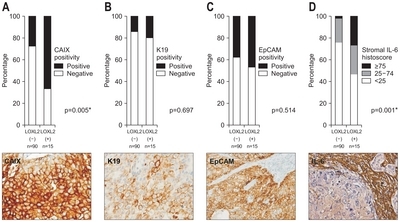 Positivity for K19 and EpCAM was defined as membranous or cytoplasmic expression in at least 5% of the tumor cells with moderate or strong intensity. For LOXL2, positivity was defined as cytoplasmic expression in at least 5% of tumor cells with strong intensity. The expression of IL-6 in fibrous stroma was semiquantitatively assessed as follows: stromal IL-6 histoscore = intensity of stromal IL-6 expression × area of IL-6 expressing stroma in TMA cores. Statistical analysis was conducted using SPSS software version 23.0 (IBM Corp., Armonk, NY, USA). The chi-square test, Fisher exact test, Mann-Whitney U-test, and independent t-test were used as deemed appropriate. Survival analyses were performed by the Kaplan-Meier method with log-rank test. Univariate and multivariate survival analyses were conducted using Cox proportional hazards ratio models. Only variables significant in the univariate analysis of factors affecting survival were used in the multivariate analysis. Estimated relative risks of event were expressed as adjusted hazard ratios (HRs) and corresponding 95% confidence intervals (CI). Statistical significance was assumed when p<0.05. Of 105 HCCs, LOXL2 positivity was observed in 15 HCCs (14.3%). In the LOXL2-positive HCCs, LOXL2 protein expression was heterogeneous, and tumor cells facing fibrous tumor stroma showed stronger cytoplasmic LOXL2 expression compared to more centrally located tumor cells (Fig. 1A). The tumor stroma did not show LOXL2 positivity. Non-tumor liver did not show strong LOXL2 expression in both of hepatocytes and fibrous tissue (Fig. 1B). Table 1 summarizes the clinicopathologic characteristics of HCCs according to LOXL2 positivity. LOXL2-positive HCCs showed higher serum α-fetoprotein levels (p<0.001), poorer tumor differentiation (p=0.011), more abundant fibrous tumor stroma (p<0.001) (Fig. 1C), more frequent portal vein invasion (p=0.020), and more advanced TNM stage (p=0.001), compared with LOXL2-negative HCCs. In addition, LOXL2-positive HCCs relatively frequently exhibited microvascular invasion (p=0.055), tumor necrosis (p=0.050), and background cirrhosis (p=0.067), compared with LOXL2-negative HCCs, although they were not statistically significant. We also analyzed the relationships between LOXL2 expression and CAIX, K19, EpCAM, and stromal IL-6 expression (Fig. 2). Of 105 HCCs, CAIX positivity was observed in 34 HCCs (32.4%). LOXL2-positive HCCs were more frequently positive for CAIX, compared with LOXL2-negative HCCs (66.7% vs 26.7%, p=0.005). K19 and EpCAM positivity was observed in 16 (15.2%) and 42 HCCs (39.0%) and there was no significant difference according to LOXL2 expression. IL-6 expression in tumor stroma was scored <25 in 75 HCCs (71.4%), 25 to 74 in 24 HCCs (22.9%), and >75 in six HCCs (5.7%). LOXL2-positive HCCs exhibited significantly greater IL-6 expression than LOXL2-negative HCCs (p=0.001). Kaplan-Meier survival analysis revealed that the patients with LOXL2-positive HCCs had shorter OS (p<0.001), DSS (p<0.001), DFS (p=0.100), and EHRFS (p=0.047) than those with LOXL2-negative HCCs (Fig. 3A). We further analyzed the prognostic significance of LOXL2 positivity in the high-risk group HCCs as follows. In 22 HCCs with tumor size >5 cm, LOXL2 positivity was associated with worse OS (p=0.002), DSS (p<0.001), DFS (p=0.035), and EHRFS (p=0.022). In 13 HCCs with portal vein invasion, LOXL2 positivity was associated with worse OS (p<0.001), DSS (p<0.001), DFS (p=0.004), and EHRFS (p=0.020). In 21 HCCs with poor differentiation, LOXL2 positivity was associated with worse OS (p=0.006), DSS (p=0.022), and EHRFS (p=0.045). In 63 HCCs with TNM stage II–III, LOXL2 positivity was associated with worse OS (p<0.001), DSS (p<0.001), DFS (p=0.037), and EHRFS (p=0.039). However, in the 31 low-risk group HCCs (TNM stage I and tumor size <5 cm), LOXL2 positivity did not show prognostic significance. The univariate survival analysis results are summarized in Table 2. Among other markers, high stromal IL-6 expression (histoscore ≥25) was significantly associated with a poor DSS (p=0.017) and DFS (p=0.028). Interestingly, co-expression of LOXL2 and CAIX, which was observed in 9.5% of all cases (n=10), was significantly associated with a poor OS (p<0.001), DSS (p<0.001), DFS (p=0.005), and EHRFS (p=0.002) (Fig. 3B). Therefore, combination of LOXL2 and CAIX seems to have better prognostic value than LOXL2 or CAIX alone. In the subsequent multivariate survival analysis, LOXL2 expression was a poor independent prognostic factor for OS (HR, 5.316; p=0.003) and DSS (HR, 7.834; p=0.012) (Table 3). Additionally, co-expression of LOXL2 and CAIX was also an independent prognostic factor for OS (HR, 6.428; p=0.004), DSS (HR, 6.458; p=0.038), DFS (HR, 6.494; p=0.042), and EHRFS (HR, 15.294; p=0.012) (Table 3). Increasing evidence supports that ECM plays an important role during tumor progression and metastasis. Previously, we discovered that HCCs with abundant fibrous stroma showed worse clinical outcome and more frequently expressed stemness-related and EMT-related markers, compared with conventional HCCs with no or little connective tissue.11 In the present study, we focused on LOXL2 protein, which is known as an ECM-modifying enzyme that is important in the development and maintenance of protumorigenic microenvironment in various cancers. Herein, LOXL2 positivity was observed in 14% of HCCs. LOXL2-positive HCCs exhibited more aggressive clinicopathologic features (poor differentiation, portal vein invasion, and advanced TNM stage), and they were also associated with abundant fibrous tumor stroma and tumoral epithelial CAIX and tumoral stromal IL-6 expression. Moreover, we found LOXL2 expression to be an independent poor prognostic factor for OS and DSS. In particular, the prognostic impact of LOXL2 positivity was revealed in HCCs with larger size, portal vein invasion, poor differentiation, or advanced TNM stage, compared to those without these aforementioned features. To the best of our knowledge, the prognostic significance of LOXL2 in HCCs has not been reported so far. HCCs with stemness-related markers, such as K19 and Ep-CAM, have been reported to present more aggressive clinicopathological features, including higher serum α-fetoprotein levels, less frequent encapsulation, more infiltrative growth pattern, more frequent vascular invasion, larger size, poorer differentiation, and more abundant fibrous stroma, compared to those without.10,34 These clinicopathological features mirrored those in HCCs expressing LOXL2 in this study, however we noted no significant correlation between LOXL2 and K19 or EpCAM expression. This may be attributed to the fact that the number of positive cases for each marker was too small to reveal statistical significance, and further studies based on a large sized cohort would be needed. IL-6, an important inflammatory cytokine, is known to play a pivotal role in survival, proliferation, stemness, and metastasis of HCC cells.35 Previously, IL-6 and LOXL2 were reported to be up-regulated in HCC cells, and influenced by cancer-associated fibroblasts promoting proliferation, migration, and invasion of HCC cells in an in vitro study.36 In addition, IL-1, IL-6, tumor necrosis factor α, and TGF-β were found to positively regulate HIF-1 and CAIX expression in HCC cells under normoxic, as well as hypoxic, conditions in vitro.37 TGF-β, which induces a fibrotic tumor microenvironment, was reported to induce LOXL2 expression.22 In the present study, LOXL2-positive HCCs showed higher stromal IL-6 expression than LOXL2-negative HCCs. Interestingly, LOXL2 expression was stronger in tumor cells facing fibrous tumor stroma, compared to more centrally located tumor cells, which was similar to patterns previously described in human laryngeal squamous cell carcinomas and breast basal-like carcinomas.18,38 Taken together, there might be crosstalk between tumor epithelial cells and tumor stromal cells in regards to the regulation of LOXL2, wherein IL-6 might be involved. Knockdown of LOXL2 in HCC cells was reported to decrease cell proliferation in vitro39 and inhibit tumor growth, intrahepatic metastasis, and lung metastasis in xenograft models.22 In addition, treatment with a LOXL2-specific monoclonal antibody, AB0023, was reported to reduce liver fibrosis and the number of fibroblasts as well as increase survival in a CCl4-induced mouse liver fibrosis model.21 Several clinical trials are ongoing with a humanized monoclonal antibody against LOXL2, AB0024 (also as known as simtuzumab), in liver fibrosis, lung fibrosis, and advanced solid tumors.24 Based on the present study of LOXL2 expression in human HCCs, LOXL2-targeted therapy might be introduced in treatment of advanced HCCs in the near future. In conclusion, increased LOXL2 expression in HCC seems to be related with fibrous stroma, and hypoxic and inflammatory tumor microenvironment. HCC with high LOXL2 expression represents a subgroup of HCC showing more aggressive behavior and poorer clinical outcomes after curative resection than those without, and LOXL2 expression in HCC is suggested to be a poor prognostic marker and a potential therapeutic target in HCC patients. This work was supported by the Myung-Sun Kim Memorial Foundation. Fig. 1. (A) Lysyl oxidase-like 2 (LOXL2) protein expression according to the fibrous stroma proportion in hepatocellular carcinomas (HCCs). HCCs with little fibrous stroma (fibrous stroma proportion <5%) do not show significant LOXL2 expression (left column), while HCCs with fibrous stroma exhibit more intense LOXL2 cytoplasmic expression (middle [fibrous stroma proportion 5%–49%] and right [fibrous stroma proportion ≥50%] columns). LOXL2 expression is more intense in tumor cells located at the interface with the fibrous stroma (inset) (original magnification, ×100, ×400 [inset]). (B) LOXL2 protein expression is absent or weak in non-tumor liver parenchyma showing chronic hepatitis or cirrhosis (original magnification, ×100). (C) Bar plot showing a significant association between LOXL2 expression and fibrous stromal proportion in HCCs. *p<0.05. Fig. 2. Expression of hypoxia-related (CAIX), stemness-related (K19 and EpCAM), and inflammation-related (IL-6) markers in hepatocellular carcinomas (HCCs) according to the LOXL2 expression status. Bar plots showing a comparison of CAIX (A), K19 (B), and EpCAM (C) expression in tumor epithelial cells and IL-6 expression (D) in tumor stroma between LOXL2-positive and LOXL2-negative HCCs. CAIX and IL-6 expression are significantly associated with LOXL2 expression. Representative cases expressing CAIX, K19, EpCAM and IL-6 are presented in the lower column (immunohistochemical stain, original magnification, ×400). CAIX, carbonic anhydrase IX; K19, keratin 19; EpCAM, epithelial cell adhesion molecule; IL-6, interleukin 6; LOXL2, lysyl oxidase-like 2. *p<0.05. Fig. 3. 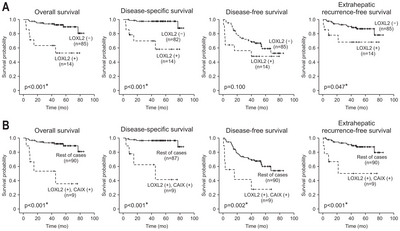 Kaplan-Meier survival curves demonstrating differences in overall survival, disease-specific survival, disease-free survival, and extrahepatic recurrence-free survival of hepatocellular carcinoma patients according to lysyl oxidase-like 2 (LOXL2) expression (A) and LOXL2 and carbonic anhydrase IX (CAIX) co-expression (B). Statistical analysis was conducted with the log-rank test. *p<0.05. Data are presented as mean±SD, number (%), or median (interquartile range). LOXL2, lysyl oxidase-like 2; HCC, hepatocellular carcinoma; HBV, hepatitis B virus; HCV, hepatitis C virus; AFP, alpha-fetoprotein; PIVKA-II, prothrombin in vitamin K absence-II; E-S grade, Edmonson-Steiner grade; TNM, tumor-node-metastasis; AJCC, American Joint Committee on Cancer; CAIX, carbonic anhydrase IX; K19, keratin 19; EpCAM, epithelial cell adhesion molecule; IL-6, interleukin-6. OS, overall survival; DSS, disease-specific survival; DFS, disease-free survival; EHRFS, extrahepatic recurrence-free survival; NS, not significant; HR, hazard ratio; CI, confidence interval; AFP, alpha-fetoprotein; PIVKA-II, prothrombin vitamin K absence-II; E-S grade, Edmonson-Steiner grade; AJCC, American Joint Committee on Cancer; K19, keratin 19; EpCAM, epithelial cell adhesion molecule; IL-6, interleukin-6; CAIX, carbonic anhydrase IX; LOXL2, lysyl oxidase-like 2. A variable was included in the multivariate analysis if its p-value in the univariate analysis was <0.05. Only variables that were statistically significant in the multivariate analysis are presented. Lysyl oxidase-like 2 (LOXL2) expression and co-expression of LOXL2 and carbonic anhydrase IX (CAIX) were separately analyzed in the multivariate analysis for overall survival (OS) and disease-specific survival (DSS). DFS, disease-free survival; EHRFS, extrahepatic recurrence-free survival; HR, hazard ratio; CI, confidence interval. Ferlay, J, Soerjomataram, I, and Dikshit, R (2015). Cancer incidence and mortality worldwide: sources, methods and major patterns in GLOBOCAN 2012. Int J Cancer. 136, E359-E386. Bruix, J, Sherman, M, and American Association for the Study of Liver Diseases (2011). Management of hepatocellular carcinoma: an update. Hepatology. 53, 1020-1022. Bruix, J, Qin, S, and Merle, P (2017). Regorafenib for patients with hepatocellular carcinoma who progressed on sorafenib treatment (RESORCE): a randomised, double-blind, placebo-controlled, phase 3 trial. Lancet. 389, 56-66. Yu, SJ (2016). A concise review of updated guidelines regarding the management of hepatocellular carcinoma around the world: 2010–2016. Clin Mol Hepatol. 22, 7-17. Cox, TR, and Erler, JT (2011). Remodeling and homeostasis of the extracellular matrix: implications for fibrotic diseases and cancer. Dis Model Mech. 4, 165-178. Lu, P, Weaver, VM, and Werb, Z (2012). The extracellular matrix: a dynamic niche in cancer progression. J Cell Biol. 196, 395-406. Levental, KR, Yu, H, and Kass, L (2009). Matrix crosslinking forces tumor progression by enhancing integrin signaling. Cell. 139, 891-906. Butcher, DT, Alliston, T, and Weaver, VM (2009). A tense situation: forcing tumour progression. Nat Rev Cancer. 9, 108-122. Schrader, J, Gordon-Walker, TT, and Aucott, RL (2011). Matrix stiffness modulates proliferation, chemotherapeutic response, and dormancy in hepatocellular carcinoma cells. Hepatology. 53, 1192-1205. Kim, H, Choi, GH, and Na, DC (2011). Human hepatocellular carcinomas with “Stemness”-related marker expression: keratin 19 expression and a poor prognosis. Hepatology. 54, 1707-1717. Seok, JY, Na, DC, and Woo, HG (2012). 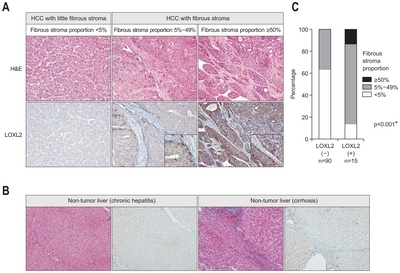 A fibrous stromal component in hepatocellular carcinoma reveals a cholangiocarcinoma-like gene expression trait and epithelial-mesenchymal transition. Hepatology. 55, 1776-1786. Barker, HE, Cox, TR, and Erler, JT (2012). The rationale for targeting the LOX family in cancer. Nat Rev Cancer. 12, 540-552. Xiao, Q, and Ge, G (2012). Lysyl oxidase, extracellular matrix remodeling and cancer metastasis. Cancer Microenviron. 5, 261-273. Wu, L, and Zhu, Y (2015). The function and mechanisms of action of LOXL2 in cancer (review). Int J Mol Med. 36, 1200-1204. Akiri, G, Sabo, E, and Dafni, H (2003). Lysyl oxidase-related protein-1 promotes tumor fibrosis and tumor progression in vivo. Cancer Res. 63, 1657-1666. Kirschmann, DA, Seftor, EA, and Fong, SF (2002). A molecular role for lysyl oxidase in breast cancer invasion. Cancer Res. 62, 4478-4483. Peinado, H, Del Carmen Iglesias-de la Cruz, M, and Olmeda, D (2005). A molecular role for lysyl oxidase-like 2 enzyme in snail regulation and tumor progression. EMBO J. 24, 3446-3458. Peinado, H, Moreno-Bueno, G, and Hardisson, D (2008). Lysyl oxidase-like 2 as a new poor prognosis marker of squamous cell carcinomas. Cancer Res. 68, 4541-4550. Peng, L, Ran, YL, and Hu, H (2009). Secreted LOXL2 is a novel therapeutic target that promotes gastric cancer metastasis via the Src/FAK pathway. Carcinogenesis. 30, 1660-1669. Li, TY, Xu, LY, and Wu, ZY (2012). Reduced nuclear and ectopic cytoplasmic expression of lysyl oxidase-like 2 is associated with lymph node metastasis and poor prognosis in esophageal squamous cell carcinoma. Hum Pathol. 43, 1068-1076. Barry-Hamilton, V, Spangler, R, and Marshall, D (2010). Allosteric inhibition of lysyl oxidase-like-2 impedes the development of a pathologic microenvironment. Nat Med. 16, 1009-1017. Wong, CC, Tse, AP, and Huang, YP (2014). Lysyl oxidase-like 2 is critical to tumor microenvironment and metastatic niche formation in hepatocellular carcinoma. Hepatology. 60, 1645-1658. Nault, JC, De Reyniès, A, and Villanueva, A (2013). A hepatocellular carcinoma 5-gene score associated with survival of patients after liver resection. Gastroenterology. 145, 176-187. Gilkes, DM, Semenza, GL, and Wirtz, D (2014). Hypoxia and the extracellular matrix: drivers of tumour metastasis. Nat Rev Cancer. 14, 430-439. Wong, CC, Zhang, H, and Gilkes, DM (2012). Inhibitors of hypoxia-inducible factor 1 block breast cancer metastatic niche formation and lung metastasis. J Mol Med (Berl). 90, 803-815. Erler, JT, Bennewith, KL, and Cox, TR (2009). Hypoxia-induced lysyl oxidase is a critical mediator of bone marrow cell recruitment to form the premetastatic niche. Cancer Cell. 15, 35-44. Schietke, R, Warnecke, C, and Wacker, I (2010). The lysyl oxidases LOX and LOXL2 are necessary and sufficient to repress E-cadherin in hypoxia: insights into cellular transformation processes mediated by HIF-1. J Biol Chem. 285, 6658-6669. McDonald, PC, and Dedhar, S (2014). Carbonic anhydrase IX (CAIX) as a mediator of hypoxia-induced stress response in cancer cells. Subcell Biochem. 75, 255-269. Colpaert, CG, Vermeulen, PB, Fox, SB, Harris, AL, Dirix, LY, and Van Marck, EA (2003). The presence of a fibrotic focus in invasive breast carcinoma correlates with the expression of carbonic anhydrase IX and is a marker of hypoxia and poor prognosis. Breast Cancer Res Treat. 81, 137-147. Trastour, C, Benizri, E, and Ettore, F (2007). HIF-1alpha and CA IX staining in invasive breast carcinomas: prognosis and treatment outcome. Int J Cancer. 120, 1451-1458. Rhee, H, Nahm, JH, and Kim, H (2016). Poor outcome of hepatocellular carcinoma with stemness marker under hypoxia: resistance to transarterial chemoembolization. Mod Pathol. 29, 1038-1049. Currie, MJ, Beardsley, BE, and Harris, GC (2013). Immunohistochemical analysis of cancer stem cell markers in invasive breast carcinoma and associated ductal carcinoma in situ: relationships with markers of tumor hypoxia and microvascularity. Hum Pathol. 44, 402-411. Pez, F, Dayan, F, and Durivault, J (2011). The HIF-1-inducible lysyl oxidase activates HIF-1 via the Akt pathway in a positive regulation loop and synergizes with HIF-1 in promoting tumor cell growth. Cancer Res. 71, 1647-1657. Kim, H, and Park, YN (2014). Hepatocellular carcinomas expressing ‘stemness’-related markers: clinicopathological characteristics. Dig Dis. 32, 778-785. Wang, CQ, Sun, HT, and Gao, XM (2016). Interleukin-6 enhances cancer stemness and promotes metastasis of hepatocellular carcinoma via up-regulating osteopontin expression. Am J Cancer Res. 6, 1873-1889. Lin, ZY, Chuang, YH, and Chuang, WL (2012). Cancer-associated fibroblasts up-regulate CCL2, CCL26, IL6 and LOXL2 genes related to promotion of cancer progression in hepatocellular carcinoma cells. Biomed Pharmacother. 66, 525-529. Kockar, F, Yildrim, H, and Sagkan, RI (2012). Hypoxia and cytokines regulate carbonic anhydrase 9 expression in hepatocellular carcinoma cells in vitro. World J Clin Oncol. 3, 82-91. Moreno-Bueno, G, Salvador, F, and Martín, A (2011). Lysyl oxidase-like 2 (LOXL2), a new regulator of cell polarity required for metastatic dissemination of basal-like breast carcinomas. EMBO Mol Med. 3, 528-544. Wu, L, Zhang, Y, Zhu, Y, Cong, Q, Xiang, Y, and Fu, L (2016). The effect of LOXL2 in hepatocellular carcinoma. Mol Med Rep. 14, 1923-1932.